Joined USKSG for a weekday sketchwalk at Balestier Road yesterday afternoon. It has been raining almost every afternoon this past week, and yesterday was no exception. It started raining once we stepped out of Loy Kee, the chicken rice restaurant. Once we arrived at our first location, the Sun Yat Sen Nanyang Memorial Hall, it started pouring. The Memorial Hall is now a museum, and I ended up spending more than an hour inside the museum before I started sketching. 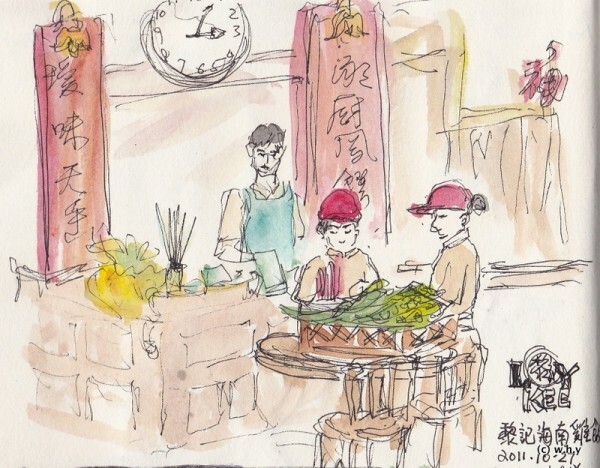 This was done at the Loy Kee Chicken Rice place, while waiting for other sketchers to finish their lunch. The waitress were folding some pandan leaves. 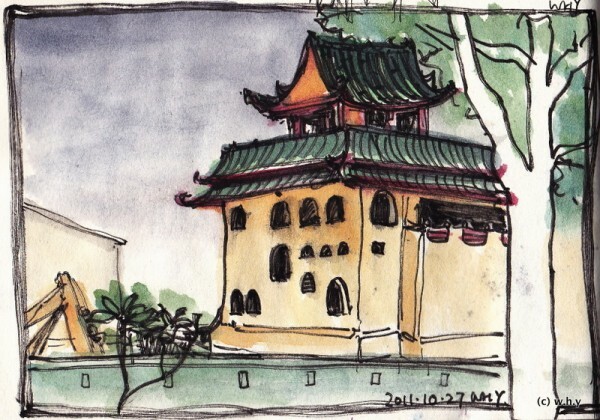 First sketch at the first floor of the Sun Yat Sen Nanyang Memorial Hall, looking out to the Phang Pheng Mei Temple. It was raining heavily outside. 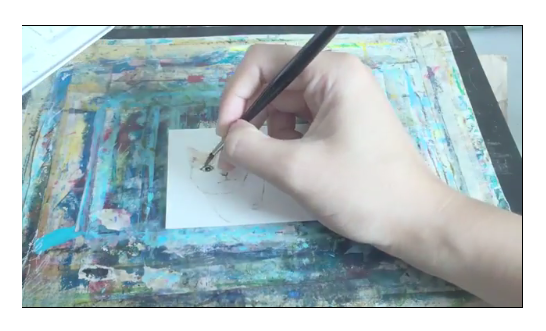 Just when I finished sketching, a staff came and said they are closing in half an hour. So I packed my stuff and went to look for other sketchers to see how they are doing. 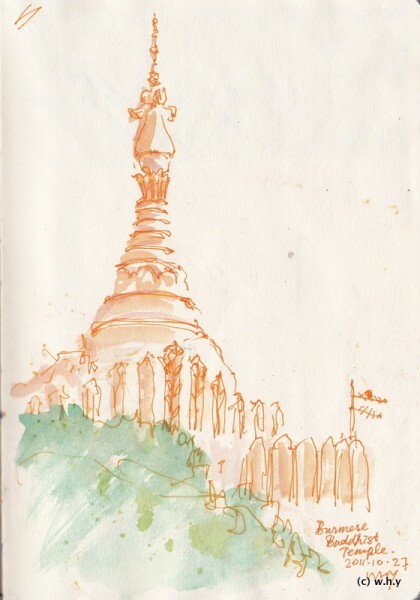 One of them was sketching the tower of the Burmese temple at the other side, and I decided to do a quick one before leaving. 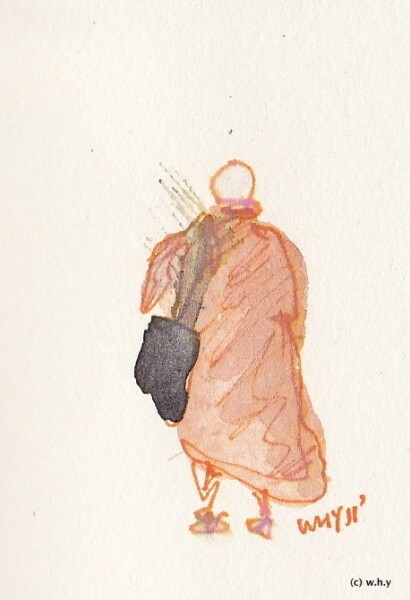 Sketched this outside the main entrance of the Memorial Hall while waiting for other sketchers. We then walked to the Burmese temple next to the Memorial Hall for the first part of the ‘show and tell’ session. 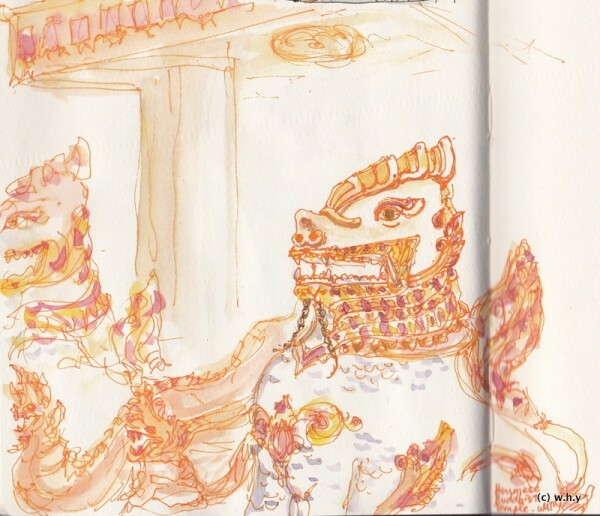 We took some group photos outside the temple, and sketched a bit more. It was a great way to spend a weekday afternoon! Hope to join more sessions like this in the future.